Over three months since he’s been speaker of the house, Paul Ryan still appears regularly in a recording made during his tenure as a Congressman in a looping video wall background behind the Fox cable channel hosts — though now his appearance (sort of) makes sense thanks to his new position on the Fox Corporation board of directors. “America’s Newsroom,” despite its name, doesn’t actually originate from a newsroom. 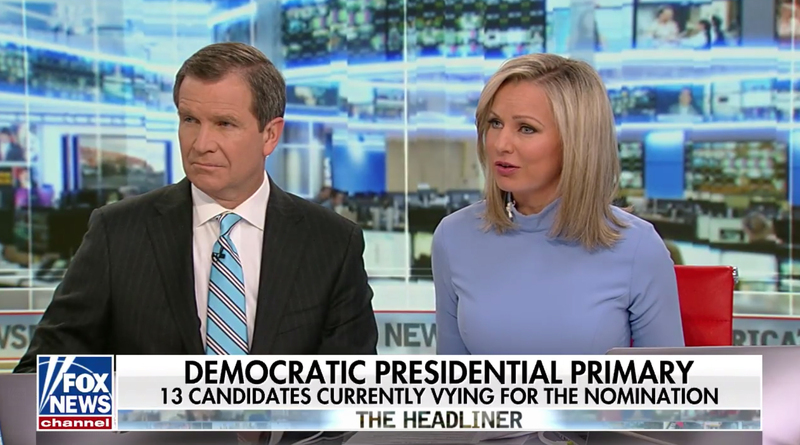 The show uses the network’s Studio J, which doesn’t have real windows overlooking the new newsroom Fox opened in January 2018, but the network often feeds a looping video of the newsroom behind its hosts. Paul Ryan appears in the background of ‘America’s Newsroom’ as shown in this composited image with the background area enlarged to show detail. The interesting thing is that Fox’s loop includes a view of a video wall in the real newsroom that has a clip of now former Congressman Paul Ryan speaking in the House of Representatives Briefing Room just to the right of the “America’s Newsroom” branding circular LED pillar. Now, with Ryan’s appointment to the cable channel’s parent company’s board, it’s almost like he’s always “watching over” the hosts sitting in front of this video wall background — typically Bill Hemmer and Sandra Smith. The same looping background also includes patriotic desktop wallpaper on some of the computer stations in the background. Fox is hardly alone in using a technique like to this to simulate a newsroom view — including ones that aren’t architecturally possible. For a long period, for example, “NBC Nightly News” feed video loops of the network’s Los Angeles newsroom behind Lester Holt and Brian Williams in the show’s main New York studio — and before that Tom Brokaw and Williams often appeared in front of a video loop of a control room in MSNBC’s former building in Secaucus, New Jersey on the rear projection walls behind them. Often these shots are edited or composited to add logos, branding or fill computer and television monitors with more generic imagery. Some blocks of CNN’s similarly named ‘CNN Newsroom‘ originate with portions of real newsrooms visible in the background. The Poppy Harlow and Jim Sciutto hour includes a rear newsroom with a video wall showcasing a video loop of a control room. 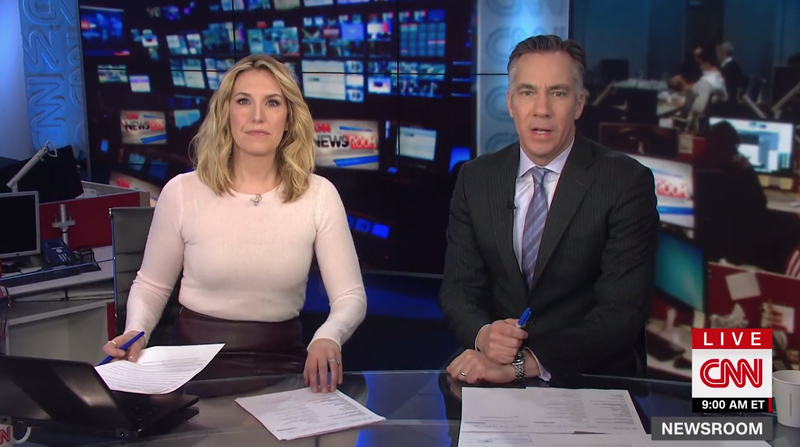 Other ‘CNN Newsroom’ blocks are produced from enclosed studios, especially weekend editions, or focus more on graphical video wall backgrounds. 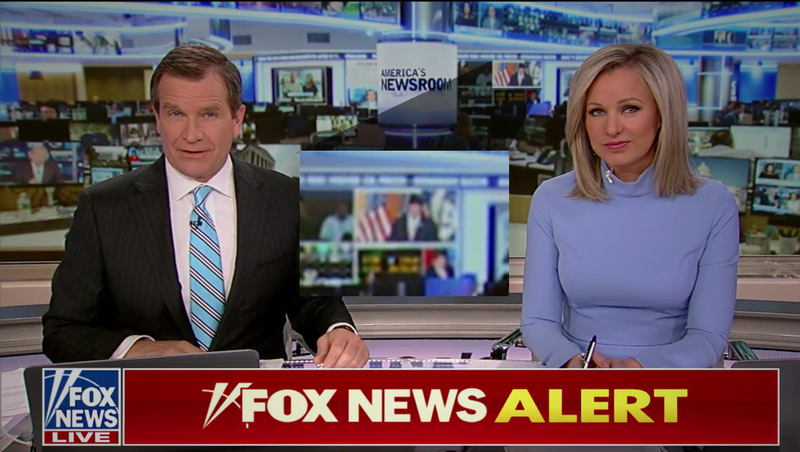 Fox also uses a even more edited video loop of the newsroom as an alternative background — with a glass ‘layering’ effect added on top that has the advantage of obscuring much of the detail of the newsroom. 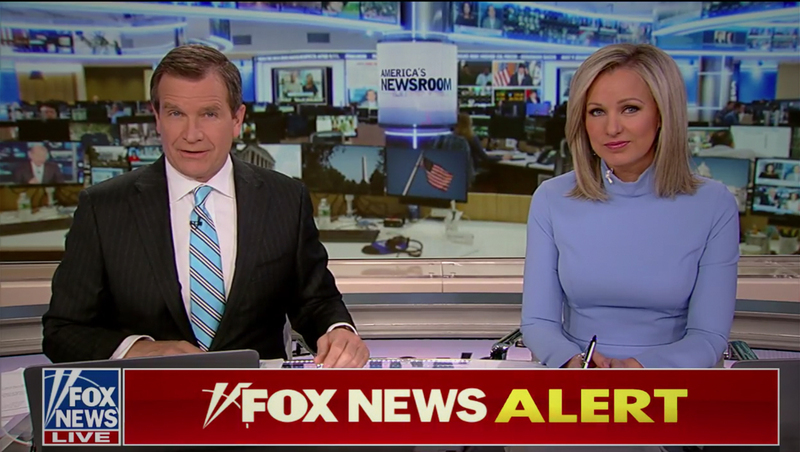 Fox’s newsroom does feature a small glassed-in studio next to it, dubbed “Studio N” — and it was temporary home to “America’s Newsroom” while Studio J was renovated, but it isn’t assigned to any regular programming at this time.